Dauphins, lamantins et Plus de «The Perfect Getaway 'Home! Préparez-vous à vous détendre dans ce paisible front de mer duplex donnant sur la baie de San Carlos avec vue panoramique sur le golfe du Mexique, Fort Myers Beach et Sanibel. Location saisonnière ou annuelle. Flambant neuf, magnifique front de mer, piscine chauffée et spa. Pieux maison avec grande véranda au 2ème et 3ème étage avec beaucoup de soleil. Entièrement meublé 3 ch / 3 salles de bain. Spacieux quai disponible avec la grande pêche en bateau. Quai flottant trop - idéale pour la baignade ou le lancement de kayaks pour une journée sur la baie! Pied, à vélo ou prendre le tramway à la belle plage de Fort Myers - seulement quelques minutes. Offrez-vous magnifiques couchers de soleil, de nombreux dauphins et lamantins observations et beaucoup de la brise de mer, lors de vacances dans cette maison de location. Vous ne voudrez plus jamais quitter! Utilities = électricité, eau, internet sans fil, câble (HBO), téléphone (longue distance domestique inclus). Remarque: les tarifs sont sujets à changement sans préavis jusqu'à ce que la réservation soit confirmée. Veuillez noter que le propriétaire habite sur un côté du duplex, mais nous respecterons votre vie privée et vous laisserons avoir un accès complet à la piscine à tout moment. Disponible plus si on le souhaite. (Taxe de séjour vaut moins de 6 mois de location). Si vous souhaitez plus de photos, se il vous plaît laissez-nous savoir. Si vous avez des questions ou si vous souhaitez regarder "The Perfect Getaway", contactez-nous. Nous aimons vivre ici - nous sommes en vacances tout le temps et nous voulons que vous vous sentiez de cette façon aussi! I spent a week here with my family just as spring training kicked off in February. House was very clean and the beds were very comfortable. Amazing views as we ate breakfast on the back screened in porch every morning before we started our day. 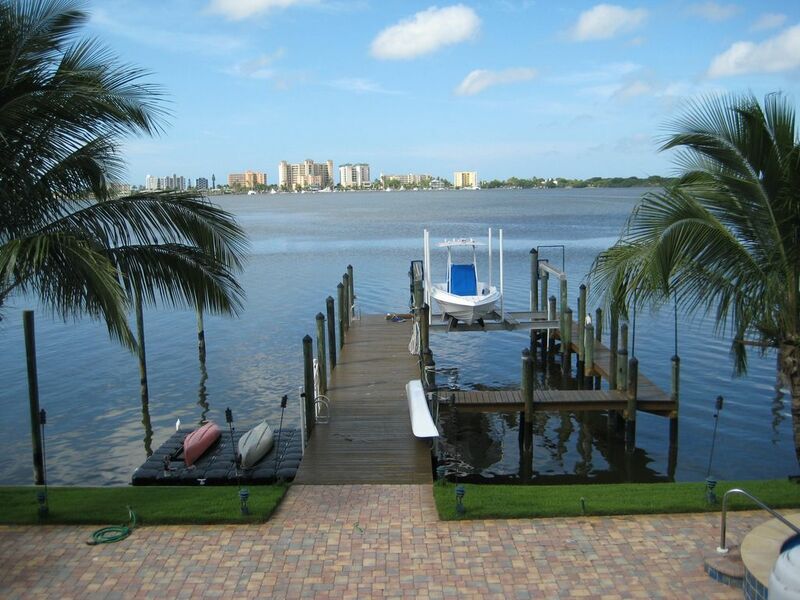 Perfect location for Fort Myers beach (2 min), Captiva (20 min), and the airport (25 min). Simple check in with all the essentials you will need. Price paid is def worth the value of the property. We highly recommend and will be back in the future. Great owners and friendly. Loved seeing the dolphins in the bay and private pool. Well equipped home. Walking or a short bus ride to the beach and restaurant s. Quite neighborhood and friendly. This property deserves a five star rating! The property was very clean, well maintained and the “extras” (paper towels, toilet paper, soap, cleaning supplies, bottled water, etc.) provided in the kitchen and bathrooms were a nice perk. The pool/hot tub area or one of the two screened porches were all exceptional settings for the beautiful sunsets! We will definitely book this property again in the future. This is my families third stay at this home obviously we have been very satisfied with this vacation Home. It is a duplex but there has never been anyone in the other half of the house. Everything you need is already there. The beds are all comfortable. You can stand in the kitchen and see all the way through the house, you can see the coconut palms swaying in the breeze The boats going by in the golf. The only thing that keeps this house from being perfect is it needs a refrigerator at pool level on the patio so you wouldn’t have to go upstairs. We are already talking about our next Stay. The property was clean well-maintained and comfortable. We had four adults and four teenagers at this home . This was our second stay here and we hope to come again next year. I would highly recommend this property. When I found this vacation home online the pictures looked beautiful. We decided to have my son's wedding in the backyard under the palm trees by the pool. When I got to the house I was happy to see it was even more beautiful than the picture showed, it was the perfect place for a wedding. We went to the local Publix grocery store and ordered a bridal bouquet, wedding cake and deli platters. The workers at the store were very helpful. The house is in a very easy to get to location by car or boat. We had a cool breeze blowing from the bay so the yard was comfortable to sit out under the palm trees in the shade or in the pool . Every day we saw dolphins and manatees swimming by the dock. We could stand at the seawall and see starfish crawling on the rocks and a lot of different kinds of fish swimming bye. we caught fish off the dock. The owner provided a canoe, for bicycles and two kayaks. My grandchildren use the kayaks and they loved it. We made sure to be back every evening to watch the beautiful sunsets . The view is perfect from anywhere on this property whether it be from the kitchen looking out through the living room you can see the water and the boats going by . A great view from the screen porches on the second level and third level. From the hot tub or the pool you can watch the beautiful sunset. I have already recommended this property to several of my coworkers. And I look forward to coming back next year. The home was very clean and supplied with everything you would need. 1 mile du centre de Fort Myers Beach. Rates are subject to change until reservation is made. Any payments made using a credit card will be charged the 2.9% credit card fee above the total charge. When we send the contract, we will let you know the dollar amount.